Those Project Car Hell tipsters who didn't want XL T-shirts- hey, I got a good deal on that size, OK?- have been waiting for a few months to get their hard-earned PCH Tipster shirts. 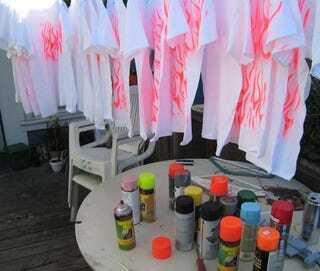 Your wait is almost over; I've finally bought some extraordinarily low-quality top-shelf blank shirts and just spent an afternoon overspraying the living hell out of them carefully applying the six stencils that make up a geniune, limited-edition PCH Tipster T-shirt. This round of shirts features different colors than did the first production run, so you new tipsters will be able to look down your noses at last year's PCH Tipster fashions. They'll be hitting the mail when I'm damn good and ready as soon as possible! Send In Project Car Hell Tips, Get A T-Shirt! PCH Tipster Shirt Rule Change #1: No tips from the eBay "Other Makes" category. I check all the cars in the eBay "Other Makes" category just about every day, so you won't be sending me anything I haven't already seen. Oh, sure, you can send in Other Makes tips if you want, but you ain't a-gettin' no shirt for it. This only applies to United States eBay; eBay.fr, eBay.de, etc... all categories are fair game! PCH Tipster Shirt Rule Change #2: Only one shirt per tipster. I appreciate the hell out of you serial tipsters, but (unless you can convince me that you've worn out your first shirt) I'm only giving you one shirt. If I've got some weird schwag on hand I might send you some... or I might not. After you get your shirt, further tips are done just for the glory. And such glory! OK? I'd really like to start getting more tips from sites other than Craigslist and eBay, so special consideration will be given to tips involving more obscure sites. Not in North America? Not in English? Not a problem! Send it in!